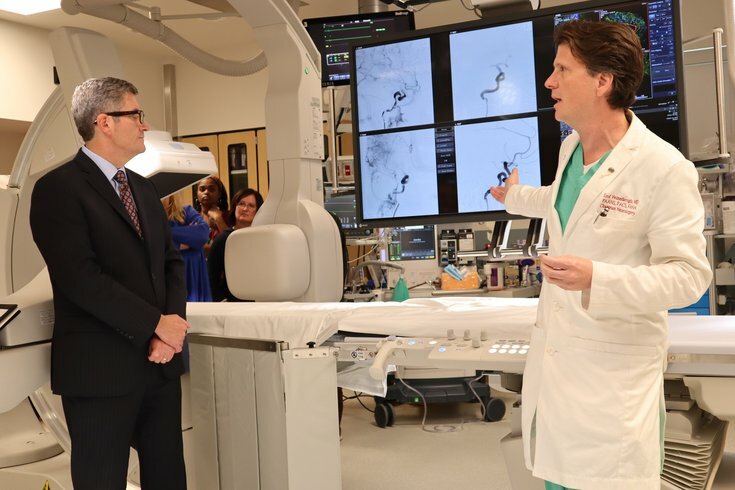 Patrick Gavin, chief executive officer of Crozer-Keystone Health System, and Dr. Erol Veznedaroglu, director of the Global Neurosciences Institute, stand alongside the new biplane angiography system installed at Crozer-Keystone Medical Center. Crozer-Keystone Health System barely had received state certification on new neurosurgical equipment when the technology was called into action. A 52-year-old Delaware County woman suffering from an acute stroke was rushed Wednesday to Crozer-Chester Medical Center, where neurosurgeons used a biplane imaging system to make an nearly immediate diagnosis and begin treatment. "She couldn't move one side of her body; she couldn't speak," said Dr. Erol Veznedaroglu, a comprehensive vascular neurosurgeon. "She showed up and went right to the table and she's doing very well now. It saved her life." Biplane imaging creates a three-dimensional image of the brain within seconds of contrast fluid being injected. That not only saves time on making the diagnosis, but increases its accuracy. High-risk patients can now get immediate surgical intervention, including those with ischemic strokes, a form often caused by blood clots. Doctors can follow the flow of blood through a patient's vessels to reach the precise location of a blood clot. Using a catheter inserted into the circulatory system, neurosurgeons can remove the clot obstructing blood flow to the brain. Before Tuesday, when the Pennsylvania Department of Public Health approved Crozer-Keystone's new equipment, the woman (and other ischemic stroke patients) would have been sent to Philadelphia or Delaware for treatment. But the time spent getting to another hospital is critical in an emergency where – literally – every minute counts. During a stroke, some 2 million brain cells die every minute, Veznedaroglu said. Now, ischemic stroke patients from the western Philly suburbs – particularly Chester and Delaware counties – can be fully treated at Crozer-Chester Medical Center in Upland. That will improve patient outcomes, doctors say. "For every 30 minutes that we can get a patient to intervention sooner, the better their potential outcome," said Dr. Karen Greenberg, who works in Crozer-Keystone's neurological emergency department. "That makes a huge difference if you're going five minutes up an elevator versus 45 minutes ... from here to get to Hahnemann in traffic." The equipment – a $4.5 million unit produced by Canon – enables patients to receive a computed tomography (CT) scan on the operating table, essential for treating ruptured aneurysms, acute strokes, and head and neck tumors through minimally invasive procedures. If necessary, it also quickly transforms into an operating room capable for performing open brain surgeries. "It's pretty one-stop shopping," said Veznedaroglu. "If a patient comes into this room with any type of neurologic problem – acute or chronic – we can take care of everything there." The addition of the technology is part of a wider investment Crozer-Keystone is making to enhance treatment in different medical areas. Crozer-Keystone recently partnered with the Global Neurosciences Institute – a group of neurosurgeons, neurologists and researchers – to bolster its neurological services. Veznedaroglu serves as the director of that organization. "This was always a wish of ours to bring full-service neurological services to Delaware County," Crozer-Keystone CEO Patrick Gavin said. "We literally have everything that the downtown hospitals have now. With certain conditions, time is really important. Because if your brain is not getting blood, it's not good." The new biplane imaging system was designed by Canon with the assistance of GNI, a process that Veznedaroglu and Canon said made the technology more intuitive. Only two other hospitals in the United States have the same model as Crozer-Keystone, Canon Senior Vice President Larry Dentice said. "The equipment is developed with neurosurgeons and with neuroradiologists," Dentice said. "It becomes very intuitive where the staff can focus on the patient, focus on the image and the equipment is almost transparent in how they use it in the room. And that's key for them because it's a stressful situation."